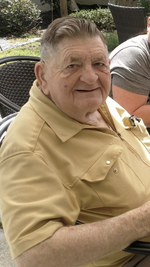 Robert Loring Dupois went home to be with the Lord June 18, 2018 at 3:28 a.m. He is preceded in death by his daughter Debbie Chaput, Sister, Gloria, and Brother-in-law, Harold Philips. Survived by his Wife, Virginia Dupois; Children, Brenda, Andy, and Eric Dupois; Grandchildren; Breanne Blackwelder, Amber Drapeau, Allen, Kendra, Taylor, and Abbigail Dupois, Great Grandchldren; Autumn Blackwelder, Chaz, and Noah Dupois, Clarissa, and Marilyn Drapeau. Family will have a graveside service at Barrancas National Cemetery July 23, 2018, at 12:30 p.m.
To send flowers to the family of Robert Loring Dupois, please visit our Heartfelt Sympathies Store.